There's a new special edition Ghibli now. 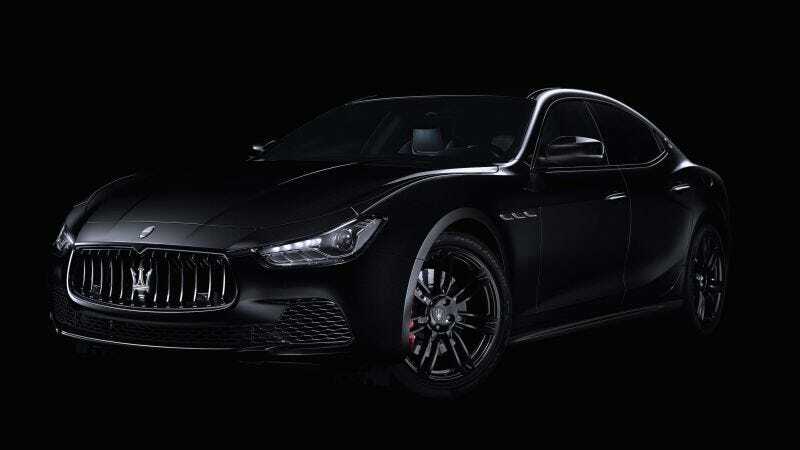 The package is available on the base Ghibli, Ghibli S, and Ghibli S Q4 models, and only 450 cars will come equipped with it. On the outside, it adds the following black-painted items: 20-inch wheels, door handles, window trim, and grille. Inside, the car gets black leather with red stitching, and a badge indicating that the Ghibli is one of 450. A few other features sweeten the deal beyond appearances. All Nerissimo models include blind spot monitoring, rear parking sensors, and remote start. The S and S Q4 models also get a Harmon Kardon sound system. The powertrain remains the same 404-horsepower twin-turbo V6 and eight-speed automatic found in the normal Ghibli. With that in mind, you pay quite a bit for what boils down to an appearance package. Turning a standard Ghibli into a Nerissimo model will add $5,650 to the $72,850 base price. Doing the same for a Ghibli S or S Q4 will add $6,800. So you had better really like the look and the exclusivity to spring for a Nerissimo. Others should probably spec out a more common version.